Today more than 1,500 police departments and public safety organizations across the globe use the Segway Personal Transporter (PT) to monitor all sorts of environments. It’s a tool that many law enforcement and private security agencies have added to their arsenal to improve visibility, mobility, community policing programs and reduce costs. Whether in the corporate workplace or patrolling the city streets, the Segway® Personal Transporter (PT) is an ideal productivity partner. 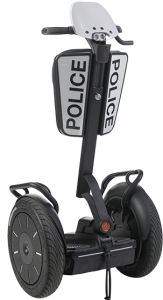 With a Segway PT, your employees can move faster, your officers can patrol larger areas, and the Segway PT’s ease-of-use greatly reduces the energy consumed by constantly walking large distances. Capital Segway specializes in partnering with our customers to train them on how to use their Segways PT and how to maintain their Segway PT fleet so they can serve as productivity enhancement tools for years to come. And because Capital Segway is a GSA certified provider, we can offer the best Segway PT packages to private firms and companies as well as all government agencies.